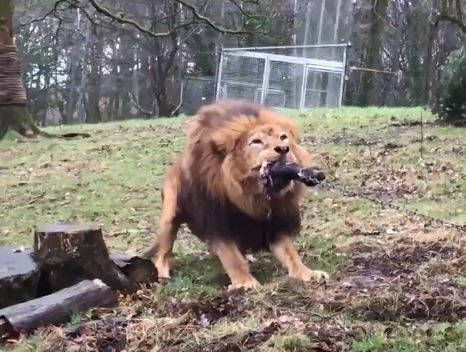 Visitors to Dartmoor Zoo can do a lot more than just look at the animals as the company offer the opportunity to play tug of war with lions and tigers. The zoo, which the Hollywood film We Bought A Zoo starring Matt Damon was based on, started advertising their ‘Human vs. Beast’ experience earlier this month. For £15, children as young as eight can take on the big felines in a game of tug-of-war, with the lions and tigers pulling the rope inside their cage, while their opponents take on the challenge from the safety of the other side of the fence. Dragan showed the keepers how strong he is and defeated them pretty quickly! This type of enrichment is very important to keep the cats fit and healthy, making them work for their food and build muscle mass. This is enrichment we do with them over the colder months. Want to get involved over half term? Ring the zoo as places are already being booked up! DRAGAN VS THE KEEPERSDragan showed the keepers how strong he is and defeated them pretty quickly!This type of enrichment is very important to keep the cats fit and healthy, making them work for their food and build muscle mass. This is enrichment we do with them over the colder months.Want to get involved over half term? Ring the zoo as places are already being booked up! You can now book our human versus beast experience. It is available between 16th-24th February and is £15pp for people aged 8+. It will either be with our male tiger Dragan or our male lion Jasiri. Though staff at the zoo claimed the games keep the lions and tigers fit and healthy, animals rights activists have criticised the organisation and the challenge. @DartmoorZoo to offer ‘Human vs Beast Experience’ this February half-term. 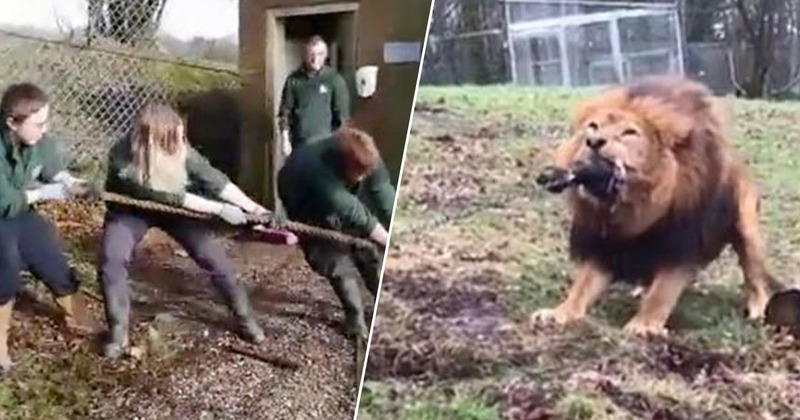 Is a tug of war game with a lion or tiger really the way to inspire respect for these animals? RT to urge the zoo to rethink this! #Don’tBuyCaptivity #KeepWildlifeinTheWild. While it’s of course sad to see the animals locked up, I don’t think there’s any harm in playing games with the ones in the zoo if it really does benefit their health and fitness. The tiger in the video wasn’t forced to grab the other end of the rope, and he could have let go if he had wanted to. Ideally the animals wouldn’t be locked up at all, but allowing them to have more interaction with visitors and keepers can surely only be a good thing for those that are. Still, the experience has caused a lot of controversy, with a petition being set up in an attempt to put a stop to the challenge. In response to the backlash, zoo owner Benjamin Mee explained he stood by his decision. People are making a fuss about nothing. I think this is 100 per cent the right thing to be doing; the lion loves it. One of problems people have potentially raised is the lion doesn’t get fed unless he wins, but obviously that isn’t the case. Another issue is around his teeth – well, have you seen pictures of lions tugging at wildebeests’ faces? Their teeth are really strong – they are not coming out. But that’s nature isn’t it, it’s gruesome. In the wild the level of force a lion puts its whole physique through is considerably more than we can replicate. They do genuinely tug with other animals over carcases [sic] and one of the things for him personally is he understands it’s for his benefit. 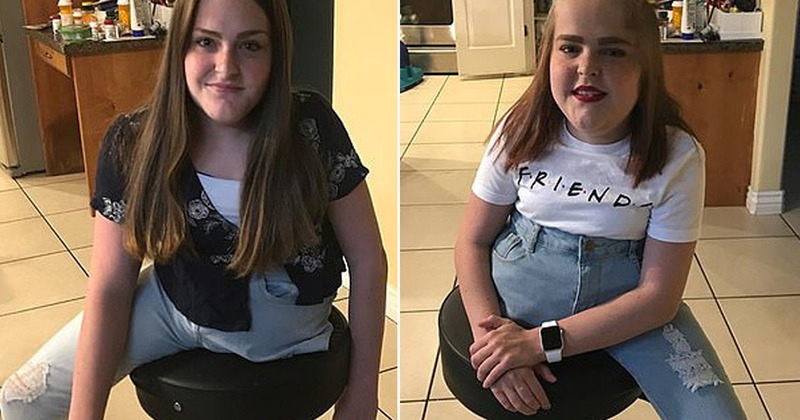 What do you think about the challenge?